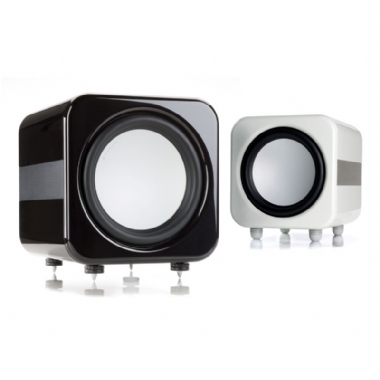 Monitor Audio Apex AW12 Sub - This Compact, front-firing 12" Subwoofer with C-CAM driver and a 500 watt Class D amplifier combines the best of Monitor Audio technology in a stylish, compact, cabinet finished with aluminium side trims. 12" Front-firing C-CAM® sub-woofer driver featuring triple suspension and 3" long throw voice coil. In order to extend the performance of its lifestyle speaker systems, Monitor Audio has created a wholly new sub-bass engine for the AW-12, designed to contribute a seismic blend of deep bass frequencies and high output with low distortion. Every component has been developed specifically for the AW-12, including the massively engineered front-firing 12" C-CAM driver and 500 watt Class D amplifier. The amplifier and its complementary high efficiency switch mode power supply are able to deliver full power with a continuous rating, equal to most other subwoofers rated at 1000 watts. This means that even in the largest rooms, the AW-12 is able to perform cleanly, dynamically and with profound effect over extended periods of listening. The AW-12's luxury looks are no less impressive. Finished in a range of lacquers (Piano black metallic, and Piano White Metallic) to complement Monitor Audio's lifestyle satellite speakers, and complete with aluminium side trims, the AW-12 has the build quality and design to blend with the richest of interiors. Its compact sealed cabinet will be easy to position, and the top-mounted control of volume and EQ are designed for easy setup and adjustment. The 12V trigger input allows for auto-activation when using a compatible A/V receiver or processor. The AW-12's new adjustable foot design has the floor spike permanently fitted with a removable heavy duty rubber cover for solid or hard wood flooring. Balancing beautifully the virtues of convenience and design, refinement and power, the AW-12 offers a devastating introduction to the benefits of superior subwoofer engineering.